What Is Kibble Cat Food? Kibble is simply processed dry dog food in tiny uniform pieces. Kibble, traditionally packaged in bags, is formulated to meet a pet's caloric and nutritional needs. There are many varieties of kibble for cats. Feeding kibble cat food has advantages and disadvantages. If you are uncertain whether kibble should be a part of your cat's diet, consult your veterinarian. 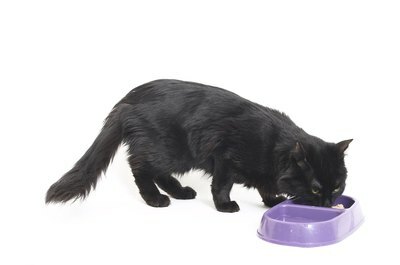 An advantage of kibble, or dry food, is that it is ideal for people who free-feed their cats. Free-feeding, or free-choice feeding, means leaving dry food out in a bowl all the time. This method allows cats to eat whenever they get hungry. It is a convenient method of feeding cats for people whose schedules do not allow them to feed their cats at regular intervals every day. Since wet or canned food can quickly spoil, kibble is the only suitable choice for free-feeding. A disadvantage of kibble is that it may not contain the right type of protein for cats. According to Lisa A. Pierson, DVM, a practicing veterinarian in Lomita, California, dry food may contain more plant protein than animal protein. The difference for cats is that they have shorter digestive systems than dogs, which can lead to digestive problems when trying to break down the cellulose in plant proteins. Also, while domestic cats can live on cat foods containing plant protein, they need animal protein to thrive. The difference-maker is the amino acid taurine, found primarily in the muscle meat of animals. Kibble labeled as natural or holistic has been minimally processed and contains no coloring ingredients, chemical preservatives, artificial flavor, or other artificial or synthetic ingredients, according to the U.S. Department of Agriculture. However, according to WebMD, not all preservatives are bad for your cat. In fact, according to Certified Veterinary Tech Mindy Bough, some are actually important antioxidants. Ethoxyquin, BHT, and BHA "have been used in pet food for more than 25 years, and when used in specified amounts, have not been found to cause harm to pets," she says. "In addition, there are natural preservatives, such as Vitamin E, that help preserve pet food." No regulatory definition exists specifically for holistic cat food, and, Dr. Larsen says, the word holistic is "used as a marketing term, and every company has a different definition for it, so it’s not particularly useful.” High-quality foods, whether holistic or not, tend to contain more nutrients that are more readily absorbed than cheaper ones. Should Cats Have Their Own Food Bowl? What Is the Appropriate Ash Content for Cat Food?